Intertrochanteric fractures are considered one of the three types of hip fractures. The anatomic site of this type of hip fracture is the proximal or upper part of the femur or thigh bone. 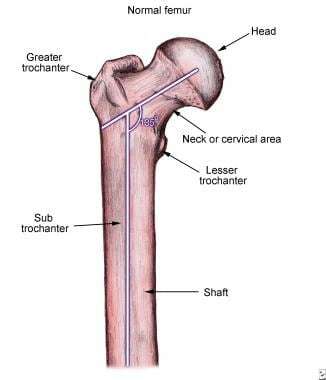 The proximal femur consists of the femoral head, the femoral neck, and the trochanteric region (including the greater and lesser trochanters). A trochanteric hip fracture occurs between the greater trochanter, where the gluteus medius and the gluteus minimus (hip extensors and abductors) attach, and the lesser trochanter, where the iliopsoas (hip flexor) attaches. The other two types of hip fractures are fractures of the femoral neck, which are proximal or cephalad to trochanteric fractures, and subtrochanteric fractures, which are distal to or below the trochanters. Although all three types of fractures are commonly referred to simply as hip fractures, the above distinctions between them are important because the anatomy, prognosis, and management are different for each type. From the early 1800s on, the literature revealed that intertrochanteric hip fractures routinely healed but were malunited in varus, leading to deformity and decreased function secondary to a limp and hip abductor weakness. However, nonoperative care of intertrochanteric fractures had significant, unacceptable morbidity and mortality because of concurrent medical problems and prolonged incumbency that prevented union from occurring. Because of these significant problems, conservative treatment was deemed unacceptable regardless of the mortality. Therefore, progress in the care of intertrochanteric fractures has involved reducing the mortality from nonorthopedic coexisting or concurrent medical problems and decreasing the degree of malunion and possible nonunion of these fractures. These improvements have allowed patients to become more functional. Trochanteric fractures are treated by using engineered metallic fixation devices (internal splintage device) designed to maintain the nondisplaced or reduced displaced fracture fragments in an anatomic, near-anatomic, or acceptable position. Fracture stability (the ability of the fracture pattern to resist deformation of weight-bearing) assists in the uncomplicated healing of the fracture. In addition, postoperative care and rates of complications, including mortality and morbidity, vary for the different subcategories of intertrochanteric fractures. Current treatment of intertrochanteric fractures involves surgical intervention. Despite acceptable healing rates with nonsurgical methods, surgical methods have replaced previous nonsurgical methods of prolonged bed rest, prolonged traction in bed, or prolonged immobilization in a full-body (spica) cast. [2, 3, 4] The acceptable healing rates for nonsurgical management were accompanied by unacceptable morbidity and mortality because of frequent nonorthopedic complications associated with prolonged immobilization or inactivity, as well as malunions compromising patient function. Currently, with a few exceptions, surgical intervention is used to treat essentially all trochanteric fractures and is described as open reduction and internal fixation (ORIF). Various internal fixation devices are available to treat essentially all trochanteric fractures. In each case, the appropriate device must be carefully matched to the specific fracture type. The correct surgical technique described by the device developer should also be used. Therefore, the optimal device is chosen after the type of trochanteric fracture has been precisely diagnosed. The indications and contraindications of the technique must also be matched with the patient's activity level, degree of osteoporosis, and realistic expected outcome. Accomplishing this match between technique and patient requires, at a minimum, technically adequate preoperative radiographs of the hip, including an anteroposterior (AP) view of the pelvis and involved hip and a true lateral view (cross-table technique). In some cases, a frog lateral view, a computed tomography (CT) scan, or even a reconstituted CT scan may be necessary to define the fracture in sufficient detail to permit accurate operative planning. Gentle traction during the radiograph will help define the fracture, particularly if significant shortening has occurred (traction view). The attachments of the iliopsoas and the gluteus medius can cause certain displacements, depending on the fracture patterns. These factors may make reduction difficult. The attachment of the gluteus maximus to the lateral femoral shaft is opposite to the posteromedially placed lesser trochanter; it thus acts as a guide to the level of the lesser trochanter and is helpful in the placement of a guide wire for the compression screw. The vastus lateralis overlies the lateral cortex of the proximal femur and must be elevated for application of a side plate. The stability of an intertrochanteric fracture is defined by the amount of contact between the proximal and distal main fragments (see the images below). A two-part fracture is very stable because once the two fragments are reduced, they are impacted on each other and provide inherent stability for the implant. In a three-part fracture, the stability of the fracture is inversely proportional to the size of the lesser trochanteric fragment. Instability occurs when more than 50% of the calcar is affected, allowing the proximal fragment to collapse into a varus position and shorten. 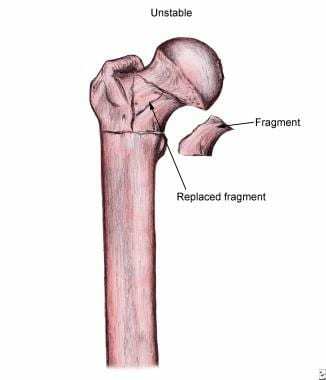 Therefore, a fracture is considered unstable if there is a large lesser trochanteric fragment or if the greater and the lesser trochanter are separate fracture fragments (four-part fracture). Another indicator of fracture stability is the intactness of the lateral trochanteric wall,  the portion of the greater trochanter that extends form the vastus ridge (the attachment of the vastus lateralis) to the tip of the greater trochanter. If this wall is fractured, the fixation construct will collapse into an unacceptable position, or the implant will cut out. The more unstable the fracture is, the more difficult reduction will be, and the more likely it is that an implant, such as a cephalomedullary nail, will be needed to stabilize the fracture and prevent collapse. Stable fractures can be treated with a sliding hip screw–plate device (two- to four-hole plate). Intertrochanteric fractures occur as consequences of either high-energy trauma (rare; seen in young male patients) or simple low-energy falls (common; seen in elderly female patients). The increasing bone fragility results from osteoporosis and osteomalacia secondary to a lack of adequate ambulation or antigravity activities, as well as decreased hormone levels, increased levels of demineralizing hormones, decreased intake of calcium or vitamin D, and other aging processes. Benign and malignant tumors, along with metastases such as multiple myeloma and other malignancies, can also lead to weakened bony structure. A direct impact or a torsional force transmitted through the leg to the intertrochanteric area will cause a fracture when such forces are greater than the strength of the bone in the intertrochanteric area. Approximately 252,000 hip fractures occur each year in the United States. Despite the relatively small incidence, hip fractures are responsible for approximately 3.5 million hospital days in the United States; hip fractures account for more hospital days than tibial fractures, vertebral fractures, and pelvic fractures combined. In addition, hip fractures account for more than half of the total hospital admissions of all fractures and more than half of the ambulance calls for fractures. A stable and acceptably fixed intertrochanteric fracture can be expected to heal. In elderly patients, the activity level usually drops by one level after recovery from this injury. The mortality is 20-30% during the first year after fracture for these patients. A prospective, randomized, single-blind study compared outcomes in patients treated with the Gotfried percutaneous compression plate versus the sliding hip screw for A1 and A2 AO/OTA intertrochanteric proximal femoral fractures. Treatment with the Gotfried plate yielded significantly shorter operating time (48 vs 78 minutes), significantly shorter incision length (56 vs 82 mm), and significantly less blood loss (41 vs 101 mL). Additionally, the patients treated with the percutaneous compression plate had lower levels of pain with activity, improved quality of life, and a better percent chance of walking independently; however, these latter results were not deemed significant. This study did not differentiate between unstable and stable intertrochanteric fractures (AO/OTA A2.2 and A2.3). As a result, the use of these techniques should be undertaken with caution in unstable fractures. Anglen et al found that from 1999 to 2006, for fixation of trochanteric fractures, there was a dramatic increase in the preference for the use of intramedullary nails that interlock proximally into the femoral head, in comparison with the use of a sliding compression screw. The intramedullary nail fixation rate rose from 3% in 1999 to 67% in 2006. Overall, patients managed with plate fixation had slightly less pain and deformity than those managed with intramedullary nailing, and no significant differences were identified with regard to function or patient satisfaction. In addition, the authors found that patients managed with intramedullary nailing had more procedure-related complications, particularly femoral shaft fracture. They noted that this change in management of trochanteric hip fractures occurred despite a lack of evidence supporting the change and the apparent potential for increased complications and cost. Bhandari et al performed a meta-analysis to identify the risk of femoral shaft fracture associated with short cephalomedullary nails after treatment of extracapsular hip fractures. They found that in studies published between 1991 and 2000, gamma nails increased the risk of femoral shaft fracture by 4.5 times when compared with compression screws. Sidhu et al studied 53 patients (average age, 77 years) after total hip replacement for trochanteric hip fractures. In the study patients, the Harris hip score at 1 month was 66 ± 7; at 3 months, 72 ± 6; at 1 year, 74 ± 5; at 3 years, 76 ± 6; and at the completion of 5-year follow-up (n = 27), 76 ± 8. The average time to return to normal daily activities was 28 days (range, 24-33 days), and no loosening or infection was observed. Della Rocca GJ, Moylan KC, Crist BD, et al. Comanagement of geriatric patients with hip fractures: a retrospective, controlled, cohort study. Geriatr Orthop Surg Rehabil. 2013 Mar. 4(1):10-5. [Medline]. Rang M. Story of Orthopaedics. Philadelphia: WB Saunders; 2000. 373-95. Kaplan K, Miyamoto R, Levine BR, Egol KA, Zuckerman JD. Surgical management of hip fractures: an evidence-based review of the literature. 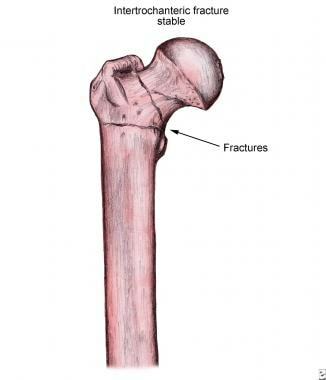 II: intertrochanteric fractures. J Am Acad Orthop Surg. 2008 Nov. 16(11):665-73. [Medline]. Anglen JO, Baumgaertner MR, Smith WR, Tornetta Iii P, Ziran BH. Technical tips in fracture care: fractures of the hip. Instr Course Lect. 2008. 57:17-24. [Medline]. Gotfried Y. The lateral trochanteric wall: a key element in the reconstruction of unstable pertrochanteric hip fractures. Clin Orthop Relat Res. 2004 Aug. (425):82-6. [Medline]. Lichtblau S. The unstable intertrochanteric hip fracture. Orthopedics. 2008 Aug. 31(8):792-7. [Medline]. Cauley JA, Lui LY, Genant HK, Salamone L, Browner W, Fink HA, et al. Risk factors for severity and type of the hip fracture. J Bone Miner Res. 2009 May. 24(5):943-55. [Medline]. Bojan AJ, Beimel C, Speitling A, Taglang G, Ekholm C, Jönsson A. 3066 consecutive Gamma Nails. 12 years experience at a single centre. BMC Musculoskelet Disord. 2010 Jun 26. 11:133. [Medline]. Yang E, Qureshi S, Trokhan S, Joseph D. Gotfried percutaneous compression plating compared with sliding hip screw fixation of intertrochanteric hip fractures: a prospective randomized study. J Bone Joint Surg Am. 2011 May. 93(10):942-7. [Medline]. Utrilla AL, Reig JS, Muñoz FM, Tufanisco CB. Trochanteric gamma nail and compression hip screw for trochanteric fractures: a randomized, prospective, comparative study in 210 elderly patients with a new design of the gamma nail. J Orthop Trauma. 2005 Apr. 19(4):229-33. [Medline]. Barton TM, Gleeson R, Topliss C, et al. A comparison of the long gamma nail with the sliding hip screw for the treatment of AO/OTA 31-A2 fractures of the proximal part of the femur: a prospective randomized trial. J Bone Joint Surg Am. 2010 Apr. 92(4):792-8. [Medline]. Bhandari M, Schemitsch E, Jönsson A, Zlowodzki M, Haidukewych GJ. Gamma nails revisited: gamma nails versus compression hip screws in the management of intertrochanteric fractures of the hip: a meta-analysis. J Orthop Trauma. 2009 Jul. 23(6):460-4. [Medline]. Sidhu AS, Singh AP, Singh AP, Singh S. Total hip replacement as primary treatment of unstable intertrochanteric fractures in elderly patients. Int Orthop. 2010 Aug. 34 (6):789-92. [Medline]. Luo Q, Yuen G, Lau TW, Yeung K, Leung F. A biomechanical study comparing helical blade with screw design for sliding hip fixations of unstable intertrochanteric fractures. ScientificWorldJournal. 2013. 2013:351936. [Medline]. [Full Text]. O'Malley NT, Deeb AP, Bingham KW, Kates SL. Outcome of the dynamic helical hip screw system for intertrochanteric hip fractures in the elderly patients. Geriatr Orthop Surg Rehabil. 2012 Jun. 3(2):68-73. [Medline]. [Full Text]. Kuzyk PR, Guy P, Kreder HJ, et al. Minimally invasive hip fracture surgery: are outcomes better?. J Orthop Trauma. 2009 Jul. 23(6):447-53. [Medline]. Moran CG, Wenn RT, Sikand M, Taylor AM. Early mortality after hip fracture: is delay before surgery important?. J Bone Joint Surg Am. 2005 Mar. 87(3):483-9. [Medline]. Schnell S, Friedman SM, Mendelson DA, Bingham KW, Kates SL. The 1-year mortality of patients treated in a hip fracture program for elders. Geriatr Orthop Surg Rehabil. 2010 Sep. 1(1):6-14. [Medline]. [Guideline] Management of hip fractures in the elderly: evidence-based clinical practice guideline. American Academy of Orthopaedic Surgeons. Available at http://www.aaos.org/research/guidelines/HipFxGuideline.pdf. September 5, 2014; Accessed: February 26, 2018. Boesgaard-Kjer DH, Boesgaard-Kjer D, Kjer JJ. Well-leg compartment syndrome after gynecological laparoscopic surgery. Acta Obstet Gynecol Scand. May 2013. 92(5):598-600. [Medline]. Carr JB. The anterior and medial reduction of intertrochanteric fractures: a simple method to obtain a stable reduction. J Orthop Trauma. 2007 Aug. 21(7):485-9. [Medline]. Sedighi A, Sales JG, Alavi S. The prognostic value of tip-to-apex distance (TAD index) in intertrochanteric fractures fixed by dynamic hip screw. Orthop Rev (Pavia). 2012 Nov 2. 4(4):e32. [Medline]. [Full Text]. Anglen JO, Weinstein JN. Nail or plate fixation of intertrochanteric hip fractures: changing pattern of practice. A review of the American Board of Orthopaedic Surgery Database. J Bone Joint Surg Am. 2008 Apr. 90(4):700-7. [Medline]. Lee SR, Kim ST, Yoon MG, Moon MS, Heo JH. The stability score of the intramedullary nailed intertrochanteric fractures: stability of nailed fracture and postoperative patient mobilization. Clin Orthop Surg. 2013 Mar. 5(1):10-8. [Medline]. [Full Text]. Desjardins AL, Roy A, Paiement G, Newman N, Pedlow F, Desloges D, et al. Unstable intertrochanteric fracture of the femur. A prospective randomised study comparing anatomical reduction and medial displacement osteotomy. J Bone Joint Surg Br. 1993 May. 75 (3):445-7. [Medline]. Thakkar CJ, Thakkar S, Kathalgere RT, Kumar MN. Calcar femorale grafting in the hemiarthroplasty of the hip for unstable inter trochanteric fractures. Indian J Orthop. 2015 Nov-Dec. 49 (6):602-9. [Medline]. Özkayın N, Okçu G, Aktuğlu K. Intertrochanteric femur fractures in the elderly treated with either proximal femur nailing or hemiarthroplasty: A prospective randomised clinical study. Injury. 2015 Jul. 46 Suppl 2:S3-8. [Medline]. Park BJ, Cho HM, Min WB. A Comparison of Internal Fixation and Bipolar Hemiarthroplasty for the Treatment of Reverse Oblique Intertrochanteric Femoral Fractures in Elderly Patients. Hip Pelvis. 2015 Sep. 27 (3):152-63. [Medline]. [Full Text]. Cankaya D, Ozkurt B, Tabak AY. Cemented calcar replacement versus cementless hemiarthroplasty for unstable intertrochanteric femur fractures in the elderly. Ulus Travma Acil Cerrahi Derg. 2013 Nov. 19 (6):548-53. [Medline]. Mangione KK, Craik RL, Palombaro KM, Tomlinson SS, Hofmann MT. Home-based leg-strengthening exercise improves function 1 year after hip fracture: a randomized controlled study. J Am Geriatr Soc. 2010 Oct. 58(10):1911-7. [Medline]. [Full Text]. Femur with plate and screws. Femur with intramedullary rod and screw. Intertrochanteric fracture with Enders nail.